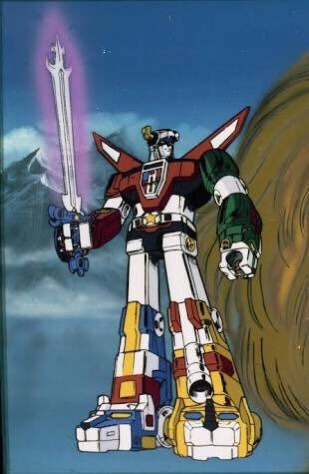 Many TCGs have what is known as a Voltron deck, named after the 80’s anime about a group of vehicles which combine to form an even bigger mecha. Typically, Voltron decks focus on taking one creature and buffing it to the ceiling with items, spells, enchantments, or whatever your game of choice uses. SolForge has been no exception to this. More often seen in draft than constructed, this usually means a Uterra deck paired with either Nekrium for regeneration and removal or Alloyin for armour and power buffs. But, of course, SolForge also has another Voltron deck, one that is even more obviously inspired by the old show- Forge Guardians. Visually there is an undeniable similarity between Voltron and the various Forge Guardians, but it is in the card mechanics that the real beauty lies. When the various smaller robots are combined in the correct way, they become one bigger and better robot instead. A part of the game since way back when in Alpha, Forge Guardians were the original janky deck for mad Johnny brewer types. Pulling off the Forge Guardian Omega was grounds for major bragging rights. As time has gone on, various expansions have brought extra tools for the deck. Some such as Forge Guardian Delta and Guardians Assemble were made specifically for the deck, while others (such as Marty McGear and the reworked version of War Tinker) are more through happy happenstance. The final push for the deck came recently in last months card rebalance. Minor buffs to Beta and (especially) Gamma have helped give the deck the final little bump that it needed to make it, if not tier 1, then at least a more mainstream choice of deck. For players that really really want to win with style and get out a Forge Guardian Omega, this deck offers three different ways. The Delta can create one in your discard pile to draw after you reshuffle (and for the record, I only realised today that this is an ETB effect and not a Forge effect. I haven’t tested whether this is a thing or just a typo- anyone that can answer this, please do! ), you can sacrifice an active Gamma and any four other Forge Guardians to put an Omega into play, and you can keep doubling up Sparky until you reach a level 1 Omega. The biggest drawback that the deck faces is the horrible lack of consistency from the nine (!?) solbound cards that Delta brings with it; they can really push the deck away from competitive. To get around this somewhat, I have included nine overload cards to try and rebalance the deck size. Edict is great for slowing your opponents down, giving you more time to dig for your Forge Guardians, and the deck has the potential to rebuild your board quickly enough. War Machine is a nice card to drop with Arcflight’s ability (although it does potentially risk interfering with the Marty procs). Burnout is one of the best damage spells at level 1; it will remove most individual level 1 creatures in the game. Of course, overload cards have their own disadvantage- playing one of them means that you are unable to then level a non-overload card. To get around this, we need to add a couple of the better levellers that the Oratek faction can provide- Killion and Oratek Battlebrand. To round the deck out, we obviously include play sets of Marty McGear and Guardians Assemble to fetch additional Forge Guardians. One notable absentee is War Tinker. Despite what I said earlier about it being a good card for the deck (and indeed the lack of level gating is a big plus), it does have the distinct disadvantage of being really small and fragile. Getting it to survive until the end of your opponents turn before it pops can be problematic. If you really want to try, I would suggest dropping a mix of some of the overload cards- everything else is obviously a little too essential. So there you have it- the latest in a long line of homages to the Big Robot That Could. There are other potential builds that you could try now- Nekrium brings reanimation, giving you another way to get Forge Guardians into play, while Mono Alloyin can give you more of a Space Marines/Armorbots feel. 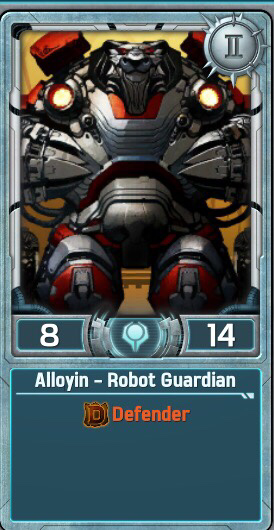 I couldn’t really think of a good way to with AU- the best I could think of was a dryads and boon getting procs off of spawning Forge Guardians, but in honesty it just wound up as a poor version of Growbots. If anyone can think of a decent AU take on Forge Guardians, feel free to let us know. Until next time, I’ll see you in the queues!